A duo guitar session allows you to soak up the rays from several sources at the same time. Naturally, each has a style and technique somewhat different from the other. More to the point, however, is what Sheryl Bailey and Chris Bergson are doing, as they communicate with the audience, with the band, and with each other. Like the city where both live and work, this session is full of contrasts. When one guitarist swings slow and comfortable, the other tends to heat things up with sparks. Taking turns being edgy, Bailey and Bergson map out a creative program that leaves room for both guitars, bass and drums to assert freely. It's all about communication. Recorded earlier this year, the session represents a reunion of sorts. Bailey and Bergson met four years ago at a Jim Hall master class. 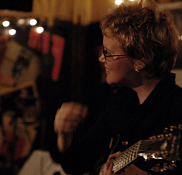 Hall's influence is felt in the way each guitarist moves the plectrum delicately to produce songs that "sing" without lyrics. Formal education prepared them for New York's dues-payin' scene: Bergson at Oberlin College and Bailey at Berklee. Both use variety in their performance. Bailey adds some welcome electric work from the rock side of jazz. Whether soloing or creating as one, the band brings substance to this reunion - which you, too, will want to attend. Track Listing: Velvet Hammer; From the Window; Homage; Reunion Of Souls; Segment; Grace; Scintilating Blue; Until the End of Never; There's a Small Hotel. 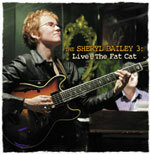 Personnel: Sheryl Bailey, Chris Bergson- guitar; Ashley Turner- bass; Sunny Jain- drums.